Hot and dry for much of the month, July saw the perennials and kitchen garden really take off. My Solanum crispum 'Glasnevin' (green leaves starting to take over the fence on the right) went mad and Kevin thankfully added more wire for me to train it along. In the Herb Border, below, I dead-headed the chives and a new lot of flower started coming up. The Pea 'Lativan' growing up the obelisk fruited and after picking many peas, I've left the rest to dry out for saving. Echinacea purpurea started flowering, as did my sweet peas. 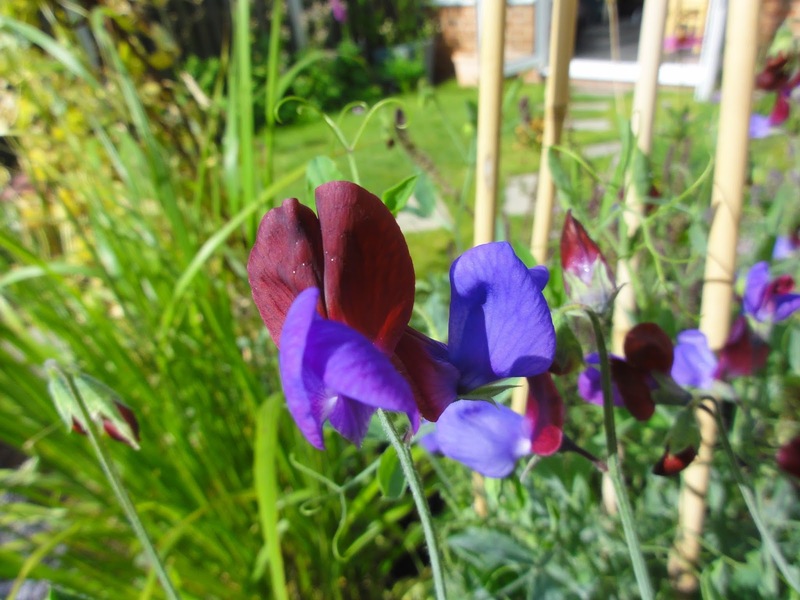 Thanks to @EWGardens, I know this sweet pea is Cupani as it has 2 flowers per stem, and the almost identical Matucana has 3 flowers per stem. I've been picking them almost daily and they reward me with fragrance in the house and abundant flowers to come. 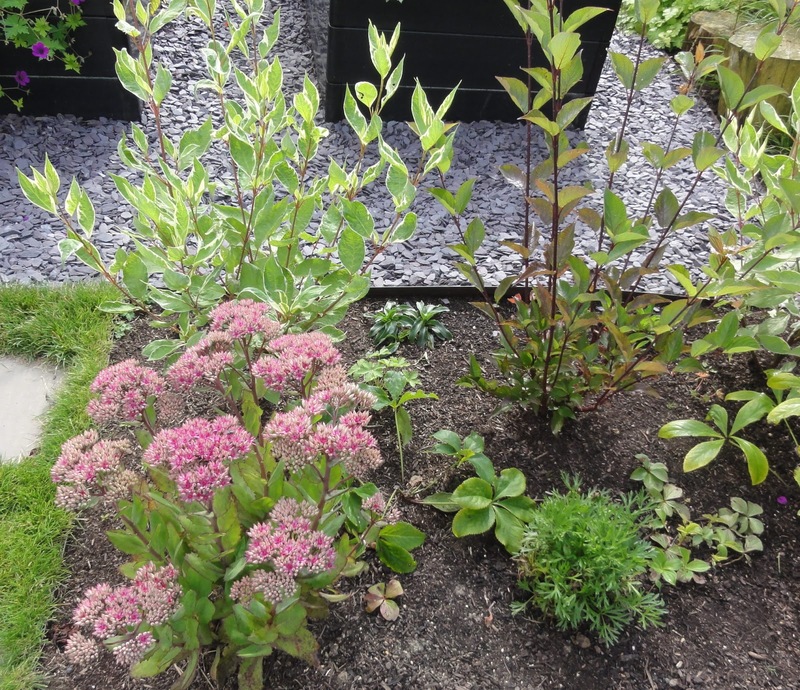 In the Cornus Border, Sedum 'Mr Goodbud' just started to flower at the end of the month, and going on past experience, the bees will be at it in no time. The major project in July was editing and replanting the 'shadiest' section of the Long Shady Border (below), which is a slight misnomer at this time of year, as even this section of this north facing border gets several hours of sun. Last month I mentioned moving the Darmera peltata to the boggy section further down the border. However, after several people mentioned how this plant can take over, I decided to put it in a large pot for now and think about what I might do with it. Maybe it will stay in the pot! Our Acer palmatum 'Sango-kaku' that was dying from being flooded has now been relocated to this non-flooding part of the border. It's looking a little worse for wear now, but I don't think it is dying, just adjusting to all the shocks and will hopefully come back next year much happier. 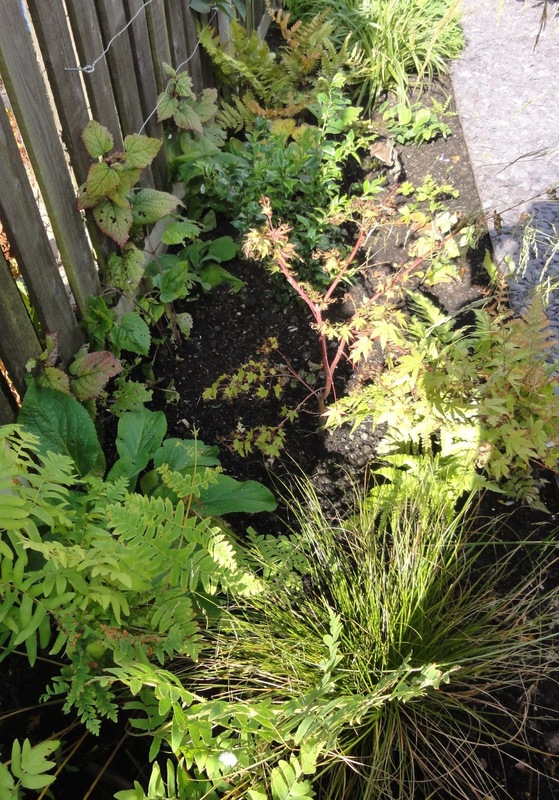 I've moved quite a few plants around (i.e.Carex testacea, Dryopteris erythrosora and a few Epimediums) in what I hope now will be a more attractive planting. I'm liking it so far but will have to see how it fills out. 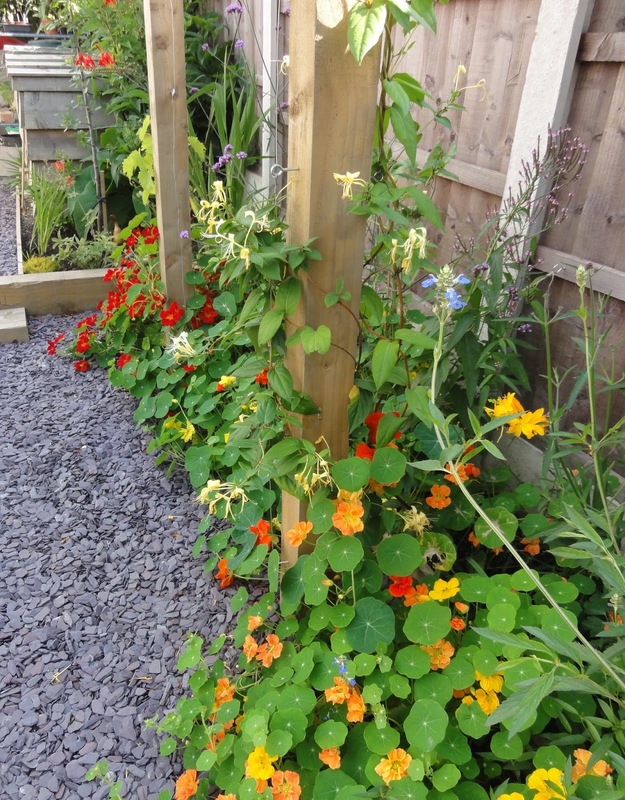 I'm really enjoying the burst of colour along the back fence (above and below). Honeysuckle Lonicera similis var. delavayi has been flowering and has a beautiful scent. The nasturtiums are also flowering profusely. 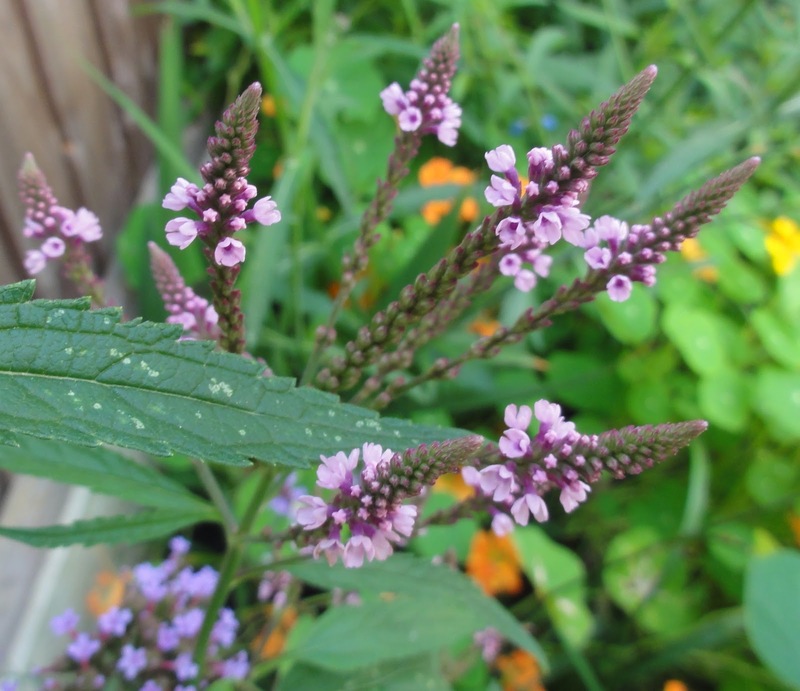 My current favourite flower, Verbena hastata f. rosea, is slightly hidden amongst some of the other plants, but here it is below in detail. 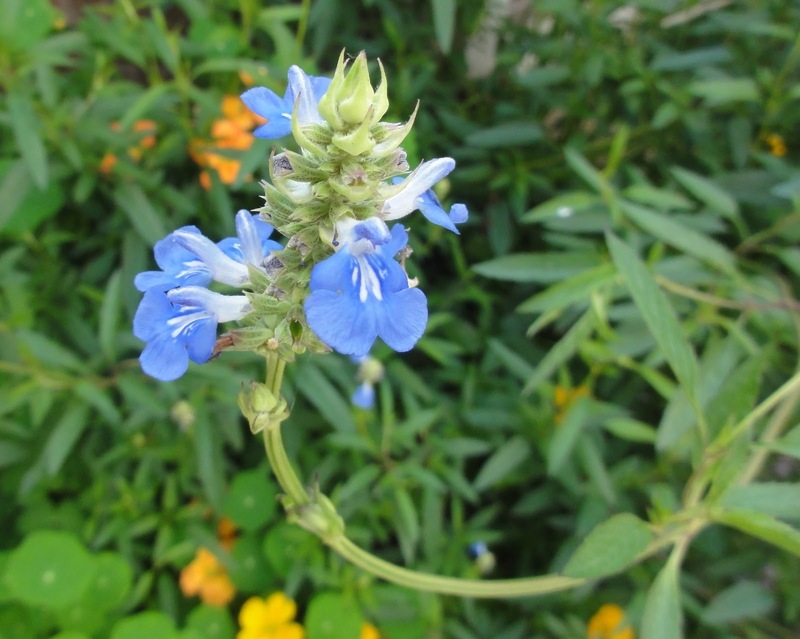 And the bog sage, Salvia uliginosa, is bursting forth with its beautiful light blue flowers. In the kitchen garden, I've been harvesting: peas, potatoes (Pink Fir Apple), lettuce, french beans (dwarf ones, the climbing take a bit longer), beetroot, carrots and courgettes. The kale and sorrel is ready to harvest too. The aubergines and tomatoes are flowering and the first tomatoes are growing, so I'm expect to start harvesting them in August. I harvested the rest of my garlic in July. 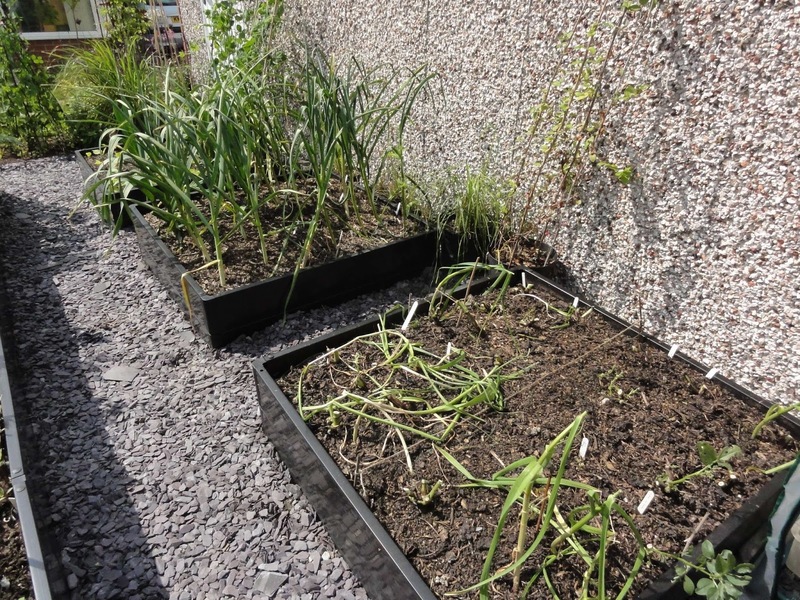 As shown at the end of June (photo), the garlic that had been under planted with the broad beans didn't do well. As you can see below, the garlic not competing with anything else, has done wonderfully. The examples below are Susan Delafield (left) and Martin's Heirloom (right). 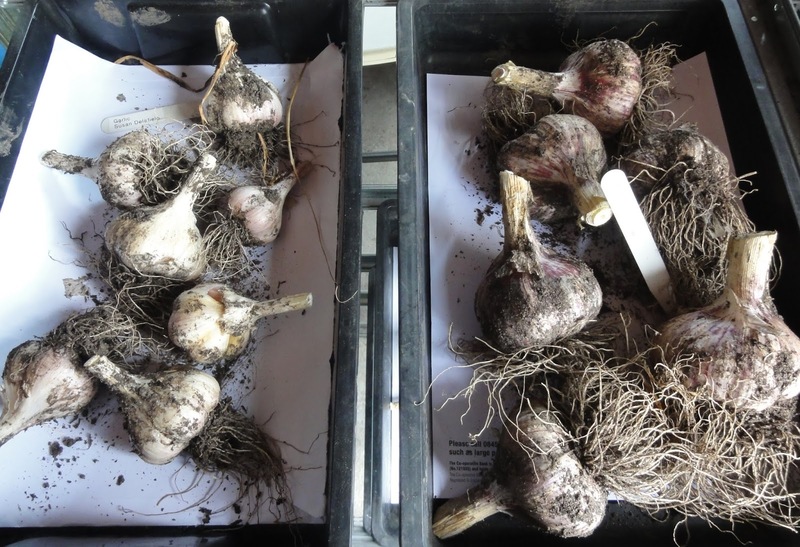 My plan for the not so good garlic is to save the bulbs and plant them out in autumn in a new bed with no competition and see what happens. 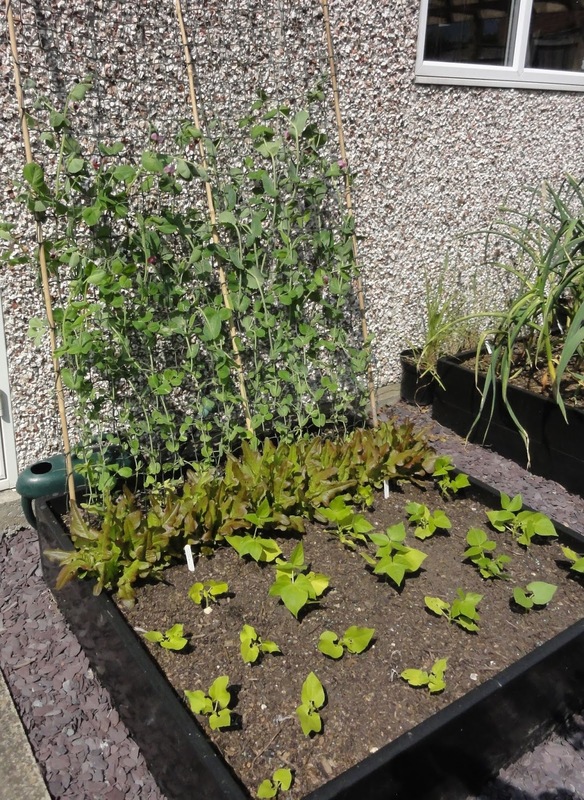 The crop that's looking amazing, to me, is the Dwarf French Beans 'Ice Crystal Wax', below right. 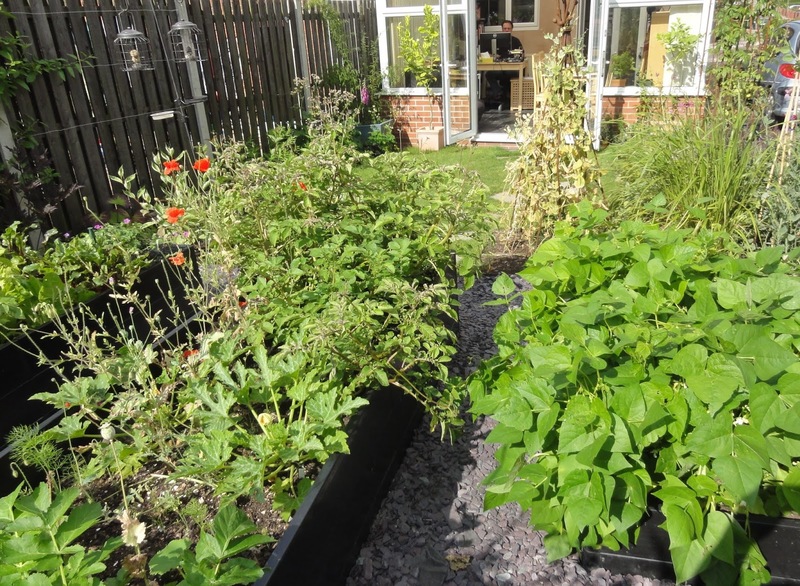 They went from being very small plants at the end of June (see photo) to large plants trying to escape from the raised bed and with a multitude of flowers that I expect to be beans in the next couple of weeks. They are a heritage variety, pale yellow, grown from saved seed from my old Oxford garden, and obviously happy in my Sheffield garden. I'm looking forward to a dwarf french bean glut in August! July was a great month in the garden. The only niggle is that I put my lower back out at the end of the month. It's improving and after a week of not gardening, I am ready to jump into August. End of month view is hosted by Helen Johnstone, aka @patientgardener. Visit Helen's blog for her July 2014 EOMV and links to other bloggers EOMV posts. I love that area along the back fence. I have a big soft spot for Lonicera - I grow Lonicera sempervirens, though sadly it is not fragrant. And the nasturtiums are wonderful. 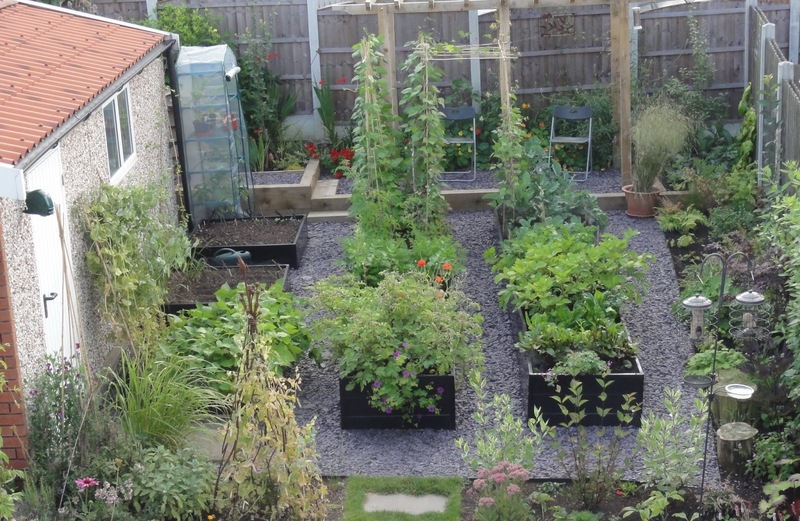 Your edibles garden is impressive - I gave up on French beans after they were repeatedly assassinated by cutworms. Glad to see it's not just me moving things around! The dwarf beans here have been constantly attacked by slugs so they're much smaller than yours.. it's the climbing bean Cobra that may provide the glut. Just love that verbena. 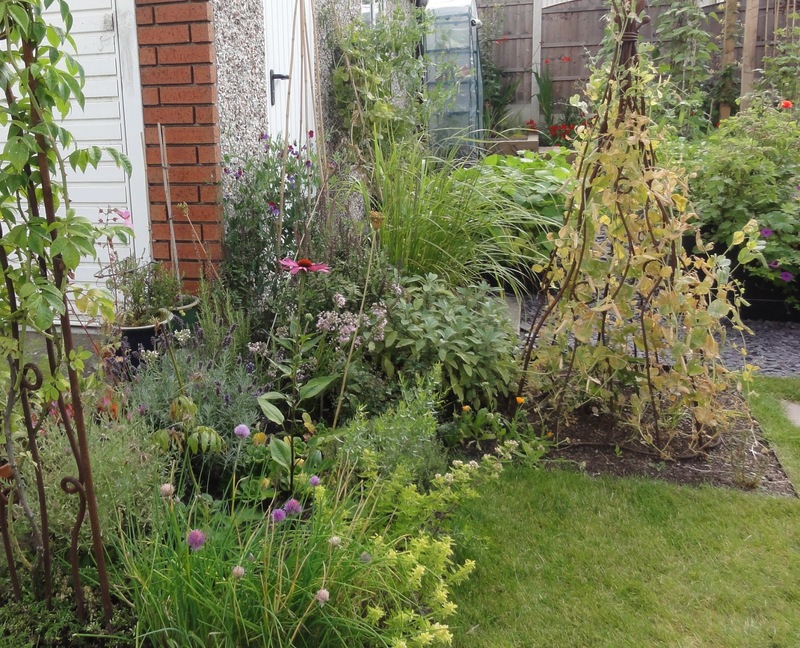 Your garden is coming on so well, everything has grown so much since your last post! Your veggies all look so healthy and you have so much variety. Your French beans are making me so jealous, mine were all eaten by slugs! 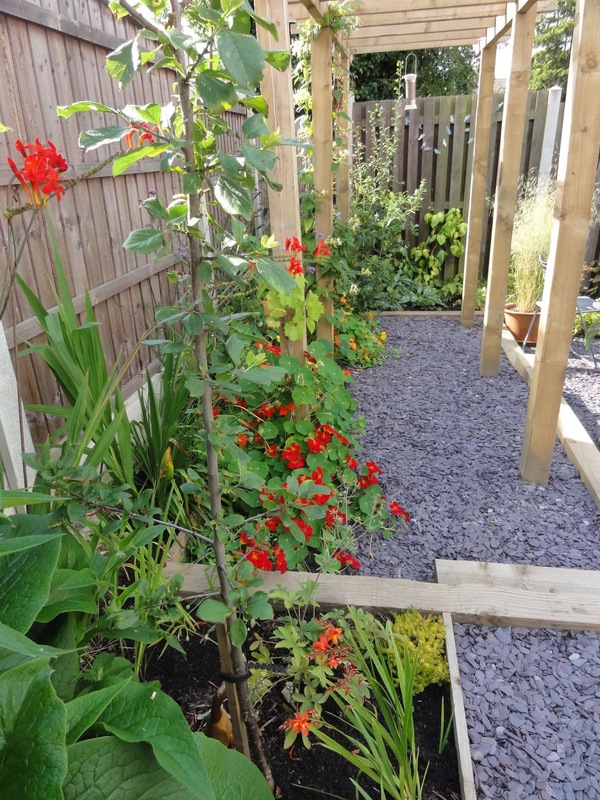 I am so jealous of your French Beans, mine all got eaten by the slugs! Everything in your garden has grown so much since I last saw it, it all looks beautiful. Honeysuckle perfume is one of my favourites, I'm sure your neighbours are enjoying it too! Thanks Jason, Rusty Duck & Pauline. I have to admit that this is my best year ever for dwarf French beans. I did wait to sow direct to the ground in May when it was drier and did protect them when very young with 'organic' slug pellets, the only form of pest control I use, other than encouraging beneficial insects etc. This is also the first time I've been able to successfully grow a honeysuckle. All previous attempts, in both pots and the ground, were badly affected by mould which stunted any flowering. I was told this variety was mould resistant and I guess that it really is! How well has everything filled out! Your garden is looking full to bursting. I'm sure your Acer will come good. I had to move a shrub a couple of days ago (to get some work done) and I've been religiously watering. It was an expensive one too. Keep your fingers crossed for me. I'll be making a note of that honeysuckle. I want one for the front garden and note that a neighbour has mould on the one she grows not far from where I intend to grow mine. 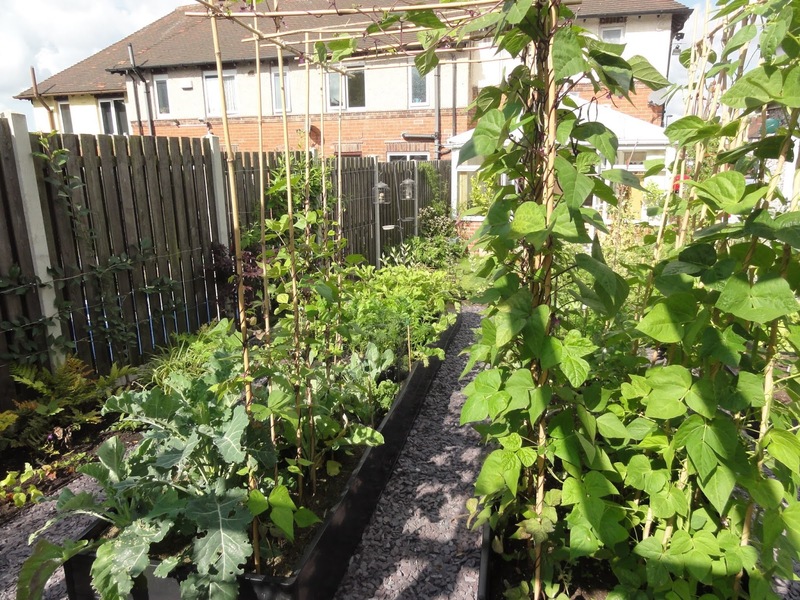 Its all looking really good, enjoy your dwarf French beans, one of my favourite crops, I've just been planting some out to fill the gaps from removing broad beans. Glad to see I am not the only one who moves plants around in summer!